Laser Therapy uses specific wavelengths of light (red and near infrared) to create therapeutic effects. These effects include improved healing time, pain reduction, increased circulation and decreased swelling. Laser Therapy is proven to biostimulate tissue, enhance repair and growth, and decrease inflammation and pain. When it comes to pain management Laser treatments are very safe and may provide dramatic results. Optimal Health Center uses K-Laser, the most advanced Laser Technology available today. 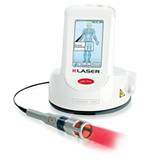 View the Benefits of K-Laser Therapy video below for more info.